Free and open to the public. There is no charge, but registration is required. After two decades of government, business, activist, and scholarly efforts to understand and fight modern slavery, exploitative practices including forced labor and human trafficking remain endemic in the global economy. A coalition of anti-slavery and labor justice advocates pushes forward to meet the United Nations Sustainable Development Goal to end child labor by 2025 and eradicate forced labor and modern slavery by 2030. These goals demonstrate an urgent need to reflect on strategy and ask what works and what does not in attempt to understand and confront these global issues. Such reflection is particularly crucial in light of warnings from scholars and activists that some anti-slavery efforts may have adverse effects, potentially harming those they intend to save. The 20th Annual Gilder Lehrman Center (GLC) Conference will provide a forum for this discussion. Organized by the GLC Modern Slavery Working Group, this public program will allow an international group of scholars and practitioners to reflect on their experiences in the field, shed light on the question of “what works?”, and discuss their work with the community at large. Panels will focus on five key arenas of the fight against modern slavery: representations of exploitation and freedom; legislation and policing; mobilizing civic and worker action; market-based solutions; and race and the aftermaths of chattel slavery. 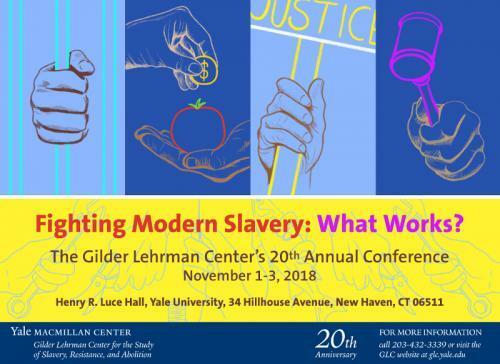 As we mark the twentieth anniversary of the founding of the Gilder Lehrman Center for the Study of Slavery, Resistance, and Abolition, we hope that this conference contributes to a turning point in global efforts to fight contemporary forced labor.